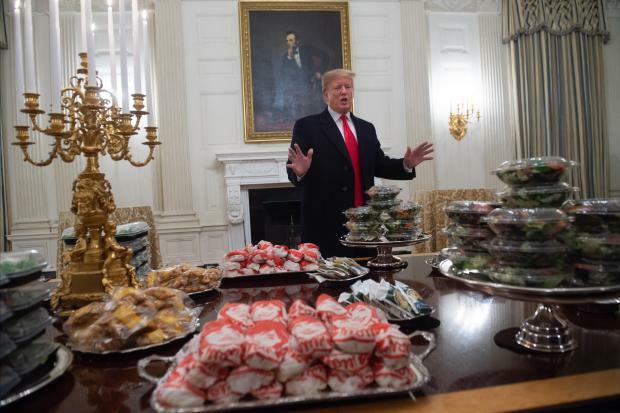 With White House residence staff among those hit by the US government shutdown, Donald Trump personally ordered in an "all American" feast of burgers and pizza on Monday for a visiting football team. "We have pizzas, we have 300 hamburgers, many, many French fries, all of our favorite foods - I want to see what's here when we leave, because I don't think it's going to be much," the president mused. Asked to name his own favorite fast food - as he stood smiling behind the gargantuan spread - Trump demurred, insisting: "I like them all." "The reason we did this is because of the shutdown," he added. "We want to make sure that everything is right, so we sent out, we got this." Around 800,000 federal employees - including much of the White House residence staff - have been on mandatory leave or working without pay for 24 days as Donald Trump and Congress wrangle over funding for a wall on the southern border.